We took a little jaunt out to the Hamilton College campus recently, braving the sub-zero temperatures. There was something we wanted to see. Lovely, aren’t they? 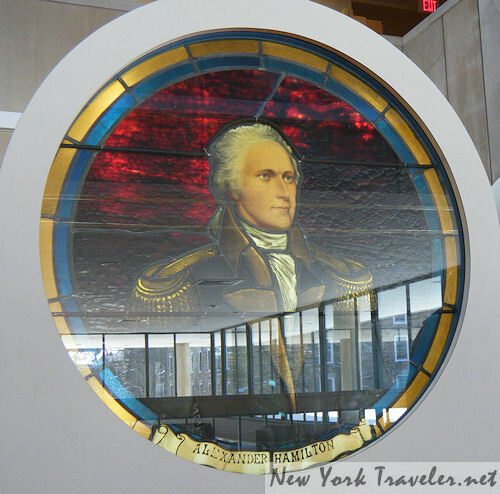 These two stained glass windows are of General Alexander Hamilton and Reverend Samuel Kirkland. Rev. Kirkland founded the college in 1793 as the Oneida-Indian Academy. It was chartered in 1812 as Hamilton College. We are great admirers of Rev. Kirkland and Mr. Hamilton. You can read some of our travels about the college and to Rev. Kirkland’s home– type “Kirkland” in the search bar to the side, and you will see a flurry of posts I’ve written, with photos. 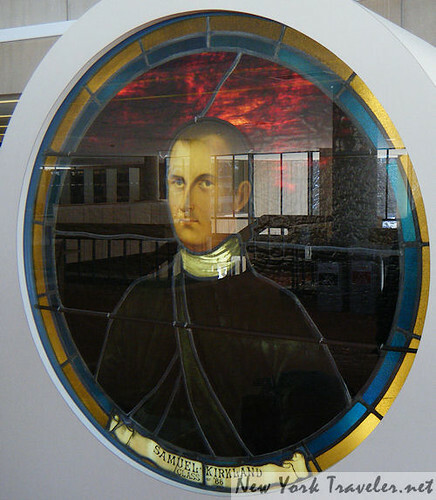 The display of the windows was created in 2009 by designer Ted Anderson from Exhibition Alliance in Hamilton, New York, with the support of the Clarence E. ’45 and Ruth F. Aldridge Chapel Fund. The windows have a long history at Hamilton College. 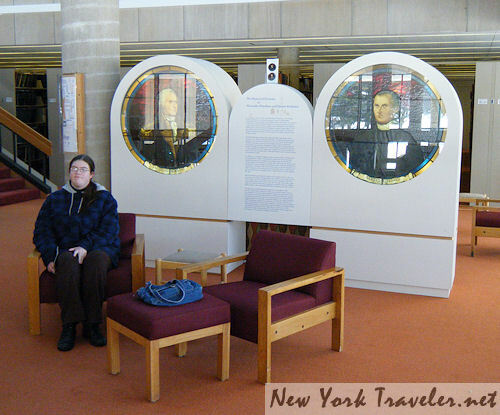 In 1898, by way of special recognition of the two key leaders in launching what became Hamilton College, it was decided to honor them with stained glass memorial portraits, installed in the College Chapel. By that time the Chapel had been “Victorianized,” its interior decor featuring dark oak pews and paneling. 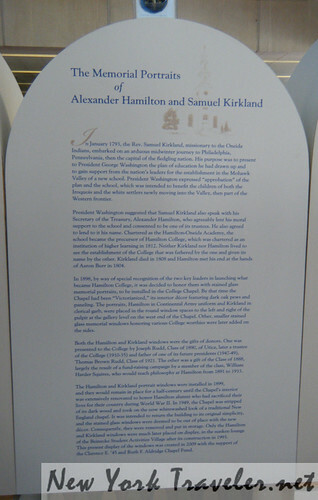 The portraits, Hamilton in Continental Army uniform and Kirkland in clerical garb, were placed in the round window spaces to the left and right of the pulpit at the gallery level on the west end of the Chapel. Other, smaller stained glass memorial windows honoring various College worthies were later added on the sides. The Hamilton and Kirkland portrait windows were installed in 1899, and they would remain in place for a half-century until the Chapel’s interior was extensively renovated to honor Hamilton alumni who had sacrificed their lives for their country during World War II. In 1949, the Chapel was stripped of its dark wood and took on the now whitewashed look of a traditional New England chapel. It was intended to return the building to its original simplicity, and the stained glass windows were deemed to be out of place with the new dÃ©cor. Consequently, they were removed and put in storage. 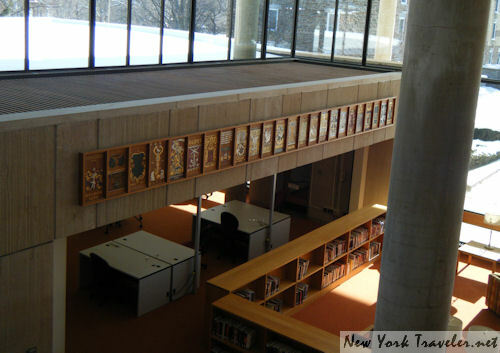 Only the Hamilton and Kirkland windows were much later placed on display, in the sunken lounge of the Beinecke Student Activities Village after its construction in 1993. The windows will now be enjoyed by all visiting Burke Library, and provide a beautiful vocal [sic] point on the second floor. While at the library, something else caught my eye: a long display of elegant woodcuts. I was completely intrigued. I asked the librarian about them. She said they were wood carving replicas of old printer’s seals, the seals a printer would stamp on the inside of the book to signify who printed it. They are lovely! I could find no further information about them, not even on the Internet. If you know more about these and who did them, please leave your information in the comments.